If you would like to improve the shape and size of your arm muscles the solution is to work them regularly. Training the arms right will tighten them up, and create more balanced and eye catching shape. How far you go in terms of size development is your call. If you took a cross section of the upper arm you’d see that the triceps (the back of the arm) makes up about 2/3 of the ‘meat’ of the arm, the biceps (the front part) only makes up about 1/3 of the arm mass. So it makes sense to spend at least the same amount of time working the triceps as you do the biceps. If you’ve become obsessed with biceps training start putting more effort into your triceps as well. The best way to train arms is through resistance exercise with weights or machines. With limited equipment a barbell or some dumbbells are enough to do the job. If you lift weights regularly you might have recognised that when you do a pulling movement for back (like a row, pull down or chin up) you are also working your biceps. When you do a pushing movement for chest or shoulders (like bench presses or shoulder presses) you work your triceps. So it’s important to consider this indirect effect when planning how you’ll fit your arm training in. Triceps’ relationship to biceps is like Scottie Pippen’s relationship to Michael Jordan. No matter how efficient or flashy 33 was, he was forever overshadowed by 23. 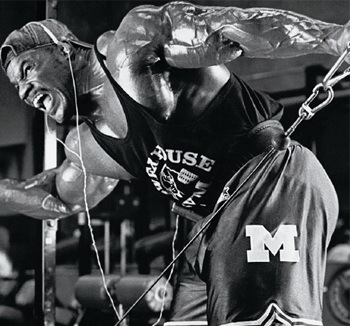 Likewise, even when the triceps do more work than the biceps, assisting in chest and shoulder presses, and even when they’re flashier, separating into strands of beads in a side tri shot, invariably the bi’s still garner the most praise. This month, HUGE is giving triceps mad props. Our five fresh ways to train your tri’s can guarantee that they’ll Always attract rapt attention. 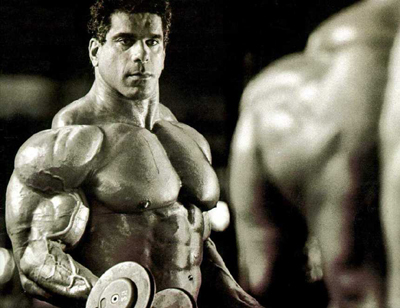 When I was a teenager just getting started in bodybuilding, I used to marvel at the biceps of Larry Scott. They were the best I’d ever seen, and to me they still rank as the best ever. Scott’s biceps heads were incredibly long, reaching past his elbows, and they were very thick and full, too. In studying my own biceps early on, I realized that Scott would be a good role model for me because I also had long muscle bellies. As much as I was amazed by the high peaks of Freddy Ortiz (Mr. America short-class champion in 1963 and 1964), I knew that there was no way I could ever attain arms that looked like his because our basic structures were too different. In time, my upper arms stretched the tape at 223.4″ cold . no pump at all. This was when I was at my biggest, 325 pounds, for the 1994 Masters Olympia, in which I finished second. For that contest, I used the same biceps routine that I had applied in preparation for the 1975 Mr. Olympia [in which he placed third in the heavyweight division]. In fact, I’ve been so pleased with the results that I still use pretty much the same workout to this day. Biceps ballooning tips from Melvin Anthony, Jr. Despite being arguably bodybuilding’s greatest showman and, at his best, sporting one of the most dramatic rear double bi shots of all time, Melvin Anthony, Jr. is the stealth pro. He rarely grabs headlines but just as rarely finishes out of a money slot. In an 11-year career, he’s won only three of the 36 shows he’s entered, including this year’s inaugural Phoenix Pro, and yet in 21 of those contests he made the posedown, and that includes three consecutive Mr. Olympia’s (2006-08). 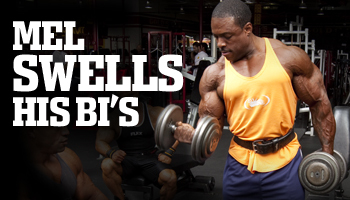 In every battle, he’s come well-armed, so we got Mel’s thoughts on biceps training and a typical “good bi” routine.